This popular design features an Elephant Family walking across the "sawengetti". These make GREAT unique gifts! -THIS IS A MADE TO ORDER PRODUCT- Let me know if you need this by a certain date and I'll try to help as my schedule changes week by week. 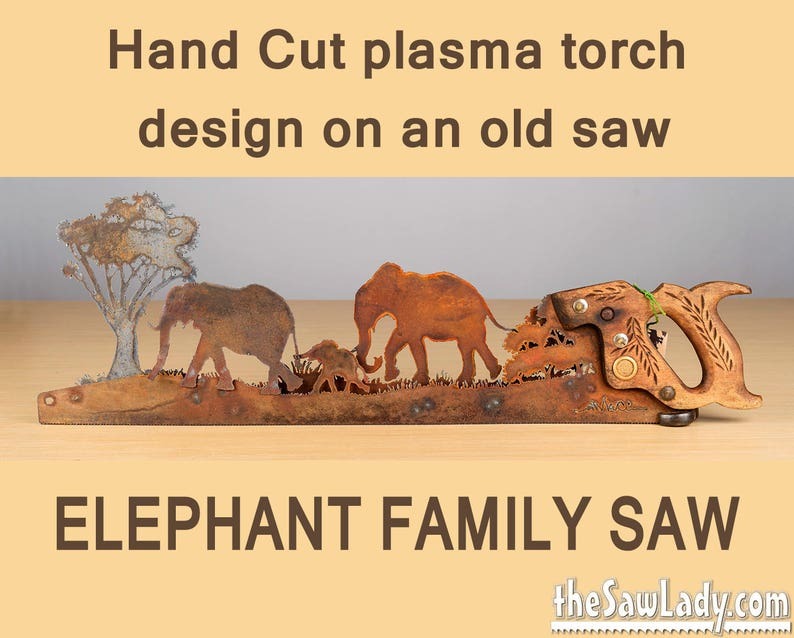 You can also add your initials (or up to 4 letters) or a name (up to 15 letters) to this saw. Select this option while ordering and then let me know what you would like! See the 'Variations' when ordering. The actual saw will be different and the design might vary slightly, The photo is a representation of the final product. Each metal art piece I make is cut by hand. This allows me to make each one a little different. It allows you to request a custom design or addition that lets you tell YOUR story. I also think that my metal art has much more character than those cut by machines. I believe that a hand made gift is always preferred to something machine made (but maybe that's just me). I’m really enjoying the process of delving deeper into metal art and exploring new techniques. A recent trip to local sales resulted in the purchase of a quantity of hand saws. This is a new ‘medium’ for me and I’m having a lot of fun designing these and then cutting them out in my shop. Most saws are approximately 29" long. I ordered this work of art for my sister's birthday with not much lead time. Cindy assured me she would try hard to have it ready, and she did! It even arrived early. My sister loves it. She praises the originality, creativity and beauty of the piece.